Rockson LubriTek are extremely proud to announce that their very own Stuart Bogg has been shortlisted as a finalist in the Unsung Hero category of the Plastics Industry Awards 2017. Now in its 17th year, the Plastics Industry Awards have firmly established themselves as the forum for recognising and rewarding excellence in an increasingly competitive market. Launched in 2001 and held annually in London, this event is dedicated to rewarding innovation and exceptional performance. The Plastics Industry Awards acknowledge the best companies and the best people in the market. 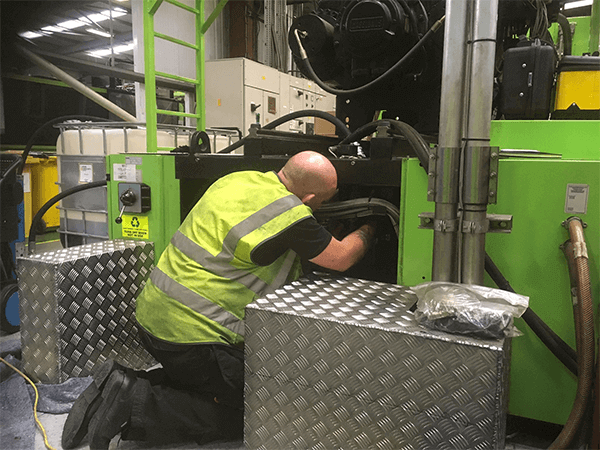 This shortlisting for Stuart recognises his 20+ years’ service to the plastics industry and the key role he has played over the years, when either filling new injection moulding machines, ensuring the hydraulic oil is filled and filtered to the machine manufacturer’s ISO cleanliness levels and then offering oil management services to manufacturers. “Another reason why his recognition is so special is down to the fact that Stuart has dedicated most of his working life offering products and services that are not prominent within the industry. Hydraulic oil is more often than not the forgotten critical component of an injection moulding machine – it’s not glamourous (unlike our bow tie design for the night) but is the lifeblood of any hydraulic injection moulding machine. For further details of this event please follow www.plasticsawards.com. For further information on the benefits your company can gain from working in partnership with Rockson LubriTek on your oil management and lubrication supply needs contact them at www.rocksonlubritek.com/contact-us.